Cathy is a Carmel, Indiana Interior Designer serving nearby cities and across the country. Lord use my eyes to see, my ears to hear and my hands to do your will. A native to Muncie, Indiana, Cathy received her Bachelors of Arts at Ball State University and later went on to complete her master’s degree at Indiana University. She was an active member in Chi Omega Sorority. She has worked in residential and commercial interior design since 1988. Her specialties include room arrangement, color coordination, and accessorizing. Cathy’s forte is traditional and transitional interiors although she has an appreciation for contemporary style. Cathy believes in using what you already have and making it better by adding new accessories. She helps clients from building a new home to adding the finishing touches on an existing space. Her style is fast paced, as she believes in goal setting and getting the job done. Cathy and her husband Larry, live in Carmel Indiana. They have a son, Logan and daughter, Jordan who are both graduates of Indiana University. Cathy is an expert at staging homes to sell. Event and wedding planning are available too. She also teaches monthly decorating classes and is a former kindergarten teacher. 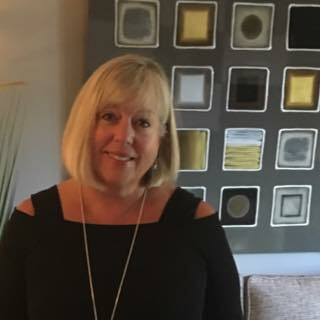 Cathy was named teacher of the year in MSD Washington Township in 1987 prior to leaving teaching and becoming an interior designer and entrepreneur in 1988. If you want a fast paced designer who believes in goal setting and getting the job done give Cathy a call at 317-566-6500.